Appeals being made to President David Granger to scrap the contract. It was announced on Wednesday that parking fees should be reduced following a meeting between President David Granger, Mayor Patricia Chase-Green, Town Clerk, Royston King, Minister of State Joseph Harmon, Minister of Communities Ronald Bulkan and Attorney-General Basil Williams. However, the MAPM and its supporters are unmoved by this development and want the contract revoked. 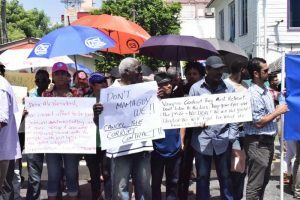 Speaking with Kaieteur News, member of the group and businessman Marcel Gaskin said that the group is not accepting the reduction. “What we want to see is the feasibility study; we want to see the impact study; we want to see the due diligence on SCS and we want to see the evidence of the tender process that was done to select SCS as the contractor or as the supplier. 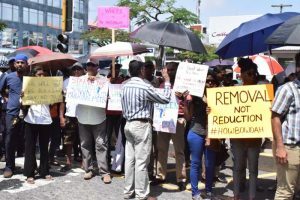 Joining with the protest movement was former Speaker of the National Assembly Ralph Ramkarran who said that the current system is absolutely horrendous. “Imagine if an ordinary office worker who is earning a little bit more than regular, has a motor car and his vehicle is seized. Protestor calling for the removal of parking meters. Notably, there was a substantial increase in the number of persons who turned out to protest against the project. Unlike last week’s demonstration there was no counter-protest group. Expressing his dismay with the project very passionately was owner of RK’s Security Service, Roshan Khan. He said that Guyanese need a chance to breathe and efforts should be directed towards developing the country’s economy. According to him the government must be reminded that if Guyanese are made to go through such nonsensical masterminding, it is possible that they can be removed. Newspaper columnist and activist, Frederick Kissoon, said that he has an ideological objection to the project in the context of the nature of the economy. “Theoretically, I think parking meters are a modern phenomenon, people pay for parking but people pay for anything in the context of whether they can afford to pay for it. That is why Barbados and Germany has free university education. Activist Mikhail Rodrigues voiced his opinion to the media that the project is a plot to frustrate the Guyanese people. “It is not logical. These are concerned people who are frustrated. I got a car but they don’t know that I hustling to pay me bills. They can’t measure the people frustration. The tone of yesterday’s event which began at noon was peaceful as promised. Protestors used their numbers and placards to express their disagreement with the project. They stood in the midday sun and dispersed promptly at 13:00hrs after singing the National Anthem.